The last pieces of the T-Mobile Samsung Galaxy Note puzzle are falling into place today, as the carrier officially announced the arrival of the renowned 5.3" phablet on its airwaves. And it's a complete affair, too, shipping with Android Ice Cream Sandwich out of the box and the Premium Suite, which includes stylus-friendly apps like the S Pen, S Memo and so on. The specs are a 5.3" HD Super AMOLED display, a 1.5GHz dual-core Snapdragon S3 processor and 42Mbps HSPA+ connectivity, 8MP rear camera, and 16GB internal memory, expandable with up to a 32GB microSD card. The handset will be available in stores and online August 8 for $249.99 after a $50 mail-in rebate, with a two-year contract. Those that qualify can get the 5.3-incher for $199.99 with an out-of-pocket down payment, and 20 equal payments of $20 a month. The Samsung Galaxy Note™ provides a unique, all-in-one experience that is perfect for work, play and everything in between. With a large, 5.3-inch HD super AMOLED™ touch screen – the largest screen on a T-Mobile smartphone – the Galaxy Note is elegantly designed to handle both business and home tasks with ease. The Galaxy Note with Premium Suite offers productivity-enhancing features, including S Pen™, S Memo™ and Polaris Office, so users can write notes, to-do lists and annotate documents; share ideas and edited content; and create documents, presentations and spresdsheets to maximize efficiency while on the go. The Galaxy Note also provides Wi-Fi Calling capabilities and, with a qualifying service plan, can act as a Smartphone Mobile HotSpot for up to five devices. 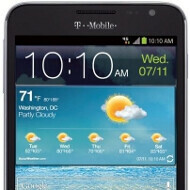 As one of T-Mobile’s fastest (HSPA+ 42 technology) devices and featuring Android™ 4.0 Ice Cream Sandwich, the Galaxy Note is an ideal device for business users always on-the-go. Productivity features such as T-Mobile 4G Pro App Pack make it easy for professionals to access the latest business apps, and with SAFE (Samsung Approved for Enterprise™) support, the Galaxy Note is prepared for any business scenario with the ability to sync corporate email, calendars and contacts. With access to T-Mobile TV in mobile HD to watch live TV programming and Samsung Media Hub to rent or buy the latest movies and TV shows, plus an 8-megapixel rear-facing camera and a 2-megapixel front-facing camera, the Galaxy Note is well equipped to keep users entertained and connected via T-Mobile’s fast 4G network.  Voice Talk allows users to give voice commands for voice dial, text message, navigation and more. The Samsung Galaxy Note is expected to be available at select T-Mobile retail stores and online at www.T-Mobile.com starting August 8. Qualifying customers can pair the Galaxy Note with a Value voice and data plan with a two-year service agreement for $199.99 with an out-of-pocket down payment and 20 equal monthly payments of $20 per month with T-Mobile’s Equipment Installment Plan (EIP). Also offered with a Classic voice and data plan, the Galaxy Note will cost $249.99 after a $50 mail-in-rebate card with a two-year service agreement. T-Mobile’s 4G HSPA+ 42 Mbps network not available everywhere. For details about coverage, please visit http://www.t-mobile.com/coverage. Use of some features may require additional charges and/or a quialifying data plan or access to a Wi-Fi connection. Mobile HD TV can deliver a bitrate of 800kbps and 16:9 resolution; the bitrate & resolution you experience will vary based on many factors, e.g., programming & network connection. 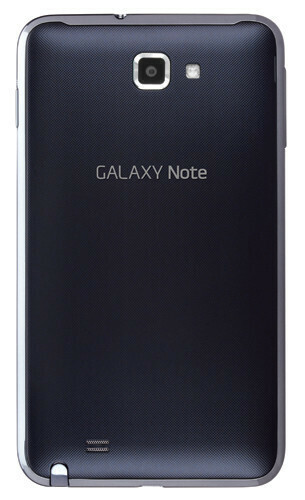 you know if the Note II is supposed to be coming out so soon why did Samsung and T-Mobile even bother with this at all? because they could get some quick sales off of it. ATT had a 6 month exclusive on the Note. That said.. why would u buy it when the SGS3 is sitting beside it? The S4 chip is bad enough.. but to buy a $250 phone with an S3 crapdragon in it? Hell no. If it were exynos, I'd buy it. that's what i'm saying. xD it just couldn't be an original Note at all. not with an S3. not with an Exynos 4210. the SIII just completely outweighs any variant of the original Note. he should've stuck with the SIII. He has a "size" fetish; like many of us. Agreed, the processor and ppi should be better on the Note (especially for what it's supposed to be). He paid full retail so, either way, he's not locked into a term contract. The Note is very similar to the SGS3. Camera is slightly different but other things are very close. and Spec-Wise they're very different. They are not very different. RAM is more on the SGS3, however, Screens are very similar and 99% of people will not notice the difference. The resolution is better on the Note. SGS3 has fast burst on the camera, which I already mentioned. I have a Note and had the opportunity to get the SGS3 via ATT at no cost and still took the Note. When you root and rom your Note with Rom's like CM9 and soon CM10 performance is great. Lastly, most people don't care about the latest and greatest when a previous model is still good, so its not stupid for T-Mo to get this device. Common people are still going with the SGS2 because of cost and other reasons. The SGS2 is still a great phone. The international Note was announced and released in 2011. The AT&T Note was released earlier this year. It will be a while before the Note II comes to the US. Their are many people who are interested in the Note on T-mobile, look at all the videos on youtube of people going through alot just to hack their AT&T Note on T-mobile network. It will do just fine. 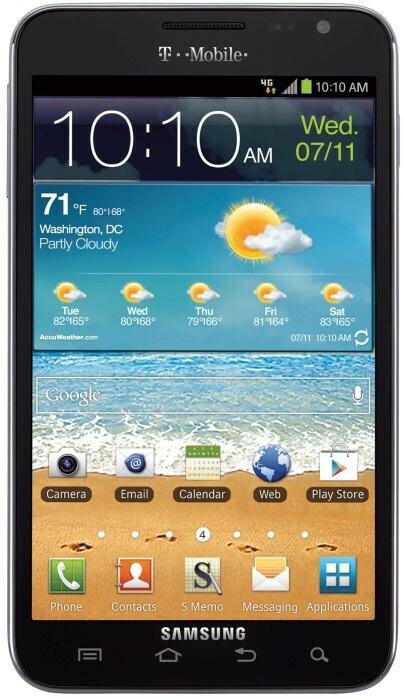 I doubt the NOTE II will be released on Verizon, their has been rumors that they are working with HTC and LG to release something similar. it was a while before the SII came to the US too but Samsung made sure that didn't happen with the SIII so it would be safe to assume that they've taken the same precautions with the Note II. anyone that's smart wouldn't take a Note over an SIII. anyone that buys a Note now is pretty much screwing themselves. just because HTC and LG are releasing Phablets on Verizon doesn't mean that Verizon doesn't want a slice of what Samsung is offering, especially after the heat they got for not offering the original Note which was supposedly coming as the Journal if i'm not mistaken. The Note and the SIII are in two different categories of phones. I don't understand why people continue to compare these two. Would you compare a Note to an iPhone, im sure that answer would be a NO. you mean because the screen is half an inch larger? don't be ridiculous. next you're going to tell me that the SIII isn't comparable to 4.3" devices and btw yes, everything gets compared to the iPhone. bad example. ...did i just read this has an s3 processor and not the s4? are they serious? yeah, it's a Note, it has an S3. that's why i've been saying to not even bother with this. And yet, most people won't care that it has an S3 processor. Why should they? Most buyers don't even know the differences between the two processors. no, I mean they should as in that it would be helpful to them. Yes, but what I meant to say is most aren't gonna care. I know hence my original reply. That's correct. Don't even bother with this.